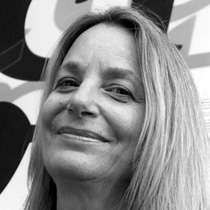 Paula Scher studied at the Tyler School of Art in Philadelphia and began her graphic design career as a record cover art director at both Atlantic and CBS Records in the 1970s. In 1984 she co-founded Koppel & Scher, and in 1991 she joined Pentagram as a partner. Drawing from what Tom Wolfe has called the “big closet” of art and design history, classic and pop iconography, literature, music, and film, Scher creates images that speak to contemporary audiences with emotional impact and appeal. Three decades into her career, these images have come to be visually identified with the cultural life of New York City. Scher has developed identity and branding systems, promotional materials, environmental graphics, packaging, and publication designs for a broad range of clients that include, among others, Bloomberg, Coca-Cola, Perry Ellis, The Museum of Modern Art, Jazz at Lincoln Center, the Metropolitan Opera, the New York City Ballet, the New York Philharmonic, the Detroit Symphony Orchestra, the New Jersey Performing Arts Center, the New 42nd Street, the New York Botanical Garden, the United States Holocaust Memorial Museum, the Robin Hood Foundation, and The Daily Show With Jon Stewart. In 1996, Scher’s widely imitated identity for The Public Theater won the coveted Beacon Award for integrated corporate design strategy. Scher is a member of the Art Directors Club Hall of Fame and a past recipient of the Chrysler Award for Innovation in Design. She has served on the national board of the American Institute of Graphic Arts (AIGA), and in 2001 she was awarded the profession’s highest honor, the AIGA Medal, in recognition of her distinguished achievements and contributions to the field. In 2006 she was awarded the Type Directors Club Medal. She holds honorary doctorates from the Corcoran College of Art and Design and the Maryland Institute College of Art. She has been a member of the Alliance Graphique Internationale (AGI) since 1993 and was elected its president in 2009. Scher has served on the board of directors of The Public Theater, and in 2006 she was named to the Art Commission of the City of New York. Her work has been exhibited all over the world and is represented in the permanent collections of The Museum of Modern Art and the Cooper-Hewitt National Design Museum in New York, the Library of Congress in Washington, DC, the Denver Art Museum, the Museum für Gestaltung Zürich, and the Bibliothèque Nationale de France and the Centre Georges Pompidou in Paris. Her teaching career includes more than two decades at the School of Visual Arts, along with positions at the Cooper Union, Yale University, and the Tyler School of Art. In 2002, Princeton Architectural Press published her career monograph, Make It Bigger.